Leanna Renee Hieber – Escape Reality, Read Fiction! Darker Still, by Leanna Renee Hieber, is a Victorian ghost story with a twist. The strange romanticism of Victorian spiritualism was particularly suited to this haunting tale of a painting that had captured rather more than just the likeness of its handsome subject. Natalie Stewart was struck mute at the age of 4 when she witnessed her mother’s death under the wheels of a runaway carriage. When our story begins, the year is 1880, and Natalie has returned to her father’s New York City townhouse after her schooling in the Connecticut Asylum. The Asylum is a school for children with unfortunate handicaps like Natalie’s; some are blind, some are deaf, some are crippled, but all are well-to-do. As is Natalie, since her father is an important man at the Metropolitan Museum of Art. An intriguing new painting has arrived in New York. It is a portrait of the late Lord Denbury. Denbury is a compelling subject in his own right, young, aristocratic and handsome. Dead by his own hand just after the portrait was completed, distraught over the death of his parents. His case is tragic. But there is something about the painting itself: it seems as if the man’s spirit inhabits the painting, almost as if he is somehow alive in that canvas. The story of the tragic young lord compels Natalie to visit the current owner of the portrait, Mrs. Northe, in spite of the fact that Natalie can only “speak” either by writing or by sign language. But Mrs. Northe is eager to meet Natalie. She almost seems to be waiting for her…and Mrs. Northe knows how to sign! When Natalie is brought before the painting of Lord Denbury, she is certain, she feels, that Denbury is trapped in the painting. Each time she looks at the painting, she sees that something has changed, something has been moved. In the painting, Lord Denbury is writing on the desk, asking her questions, communicating with her! Natalie takes Mrs. Northe into her confidence, fearful that she will be thought mad. But when Mrs. Northe believes her, they conduct an experiment. Natalie touches the painting, and falls in–to the world of the painting, where Lord Denbury waits for her to save him. On that other side of the canvas, Natalie must face her greatest hopes, and her greatest fears, in order to have the chance at a real life. The one thing that she feared her handicap had placed forever beyond her reach. Escape Rating B+: This was a neat story to be reading the night before Halloween. Very gothic, with an added slice of the Picture of Dorian Gray thrown in for good measure. Just a slice. While I enjoyed Natalie as a character, I found that having the entire story told from her first-person point-of-view to be a little limiting. I wanted to know a lot more about why the other characters were doing the things they did. Mrs. Northe’s motivations were not as clear as they might have been. Was her flirtation with Natalie’s father a ruse, or was she genuinely interested? Why did the demon choose Denbury in the first place? What society of devils? Who else is involved? I still have questions. And how are Natalie and Denbury going to get out of the pickle they’re in? When is the next book????? 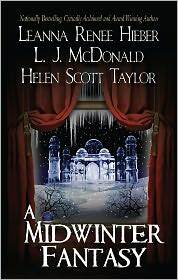 A Midwinter Fantasy is a collection of three novellas that take place at, of course, Midwinter. In all three of the stories, it is the festival of giving, but because all of the stories are fantasy romances, the holiday celebrated is not always or not exactly Christmas. The first story in the collection is A Christmas Carroll by Leanna Renee Hieber, and the story is set in the same storyline as her Strangely Beautiful series. 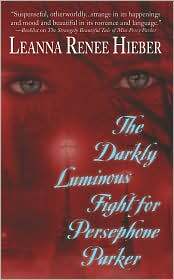 In fact, the action of this Christmas tale takes place directly after the events of The Darkly Luminous Fight for Persephone Parker. Not being familiar with the previous tale, I felt like I had been dropped into the middle of a story, only because I had been. Once I caught up, things got a lot more interesting. The title of the story is a play on both Dickens’ classic and the name of one of the characters. The author’s world is a close parallel to our Victorian era, except that the Victorian fascination with spiritualism represents concern about a real, and sometimes dangerous threat. But the spirits of Hieber’s “Whisper-World”, can also help the living, just as Marley’s Ghost arranges in Dickens’ famous Christmas Carol. The “Carroll” in Hieber’s story is Michael Carroll, and the spirits help both him and Rebecca Thompson to discover not the true meaning of Christmas, but the true meanings of both friendship and love in this wrap-up of her series. Although enough of Michael and Rebecca’s story was told in flashbacks for me to empathize with them, I would have enjoyed this more if I had read the entire series. But I enjoyed it enough, and I was intrigued enough, that I plan on going back and reading everything! The Worth of a Sylph by L.J. McDonald is the second piece in the book. Lily Blackwell is an elderly woman who raises orphans in a remote house in Sylph Valley. She is also the human Master of a Battle Sylph named Mace. Mastery can be an equitable, loving arrangement, and in this case it is, although it is not always so. Sylphs provide the different types of magic that keep the Valley heated, the crops irrigated, provide water for washing, and protection, among other things. Linking to a master provides a Sylph with nourishment, including emotional sustenance, and a way of remaining in the world. When the last of Lily’s orphans runs away, out of the Valley, she tasks Mace with retrieving the boy, no matter where he has gone. She also charges him with finding himself a new master before she dies, one that she can approve of. On Mace’s quest, he finds, not just the boy he was sent for, but a woman he can truly love and spend a life with, and not just one son, but two. The story takes place during the Winter Festival, which is supposed to be celebrated with family. There is a message in the story that the family you create with love can be much stronger that the one you are born to. Although Worth of a Sylph is also a part of a continuing series that begins with The Battle Sylph, it was much less obvious about it. I was able to jump right into the story and be involved with the characters right away. The story was complete in and of itself. Last, but not least, the final story in this anthology is The Crystal Crib, by Helen Scott Taylor. I said not least, because the story deals with some larger than life figures, the Norse gods. Odin is the bad guy, having kept a father from his daughter for over 2,000 years, and enslaving his sons for the same length of time, all for crimes that other people committed. Odin is someone who really knows how to hold a grudge! Sonja thinks she has come to Iceland to convince the owner of “Santa’s Magical Wonderland” to allow her Aunt’s travel company to arrange tours to his resort. Little does she know that the owner of the resort is Vidar, the son of Odin, and, is also the “Guardian Angel” who has been protecting her all of her life. And, that her life has been considerably longer than the scant decades she remembers. Her unexpected presence in Odin’s backyard forces a confrontation among the gods, monsters and angels who have protected her for her entire existence, and brings surprising dangers and rewards to everyone in her path. This was a story about love truly conquering all. This story is set in the same universe as Taylor’s The Magic Knot, but it reads as a stand-alone. I read it as someone playing tricks on Odin, which, considering the story, and considering other stories about Odin, seemed perfectly fair to me. However, this was also the least satisfying of the three stories. I wanted a lot more explanation for a 2,000 year old grudge than I got. And the heroine took the fact that she had been in suspended animation for those same two millennia a bit too much in stride, especially factoring in that her lover had been watching over her the entire time! Oh, and she might not die, ever. There was a bit too much fantasy in this fantasy. Out of three stories, I vote Sylph very satisfying and complete, Carroll good and intriguing enough to make me want more, and Crystal not satisfying enough to make me go back for a return visit to the author’s world. YMMV. Escape Ratings: Christmas Carroll B+, Worth of a Sylph, A and, The Crystal Crib, C.